Earlier this year, my girlfriend, Phoenix was offered a tenure track teaching position at HKU, a respected university in the Netherlands. It was too good of an offer for her to pass up, despite having a pretty well established life in NYC. My job at CCNMTL involves many aspects, but the bulk of it is programming and sysadmin work that I can ultimately do anywhere I have access to a computer and a good internet connection. I've been living in NYC since 1999 and as much as I love it, I was ready for a bit of a change. So I worked out a telecommuting arrangement, packed up my life, and headed across the Atlantic with her. The last few months have been a whirlwind of paperwork, packing, and travelling. The process of moving internationally, I wouldn't wish on my worst enemy. It's been expensive, stressful, and exhausting. Frankly, we're both impressed that our relationship has remained intact through it (just don't put us in a rental car with me driving and Phoenix navigating, and everything will be fine). I may write more later about the trials and tribulations of international Apostille, international health insurance plans, bank transfers, Dutch immigration bureaucracy, and moving a cat to Europe, but take my word for it that all of those things should be avoided if you can manage it. 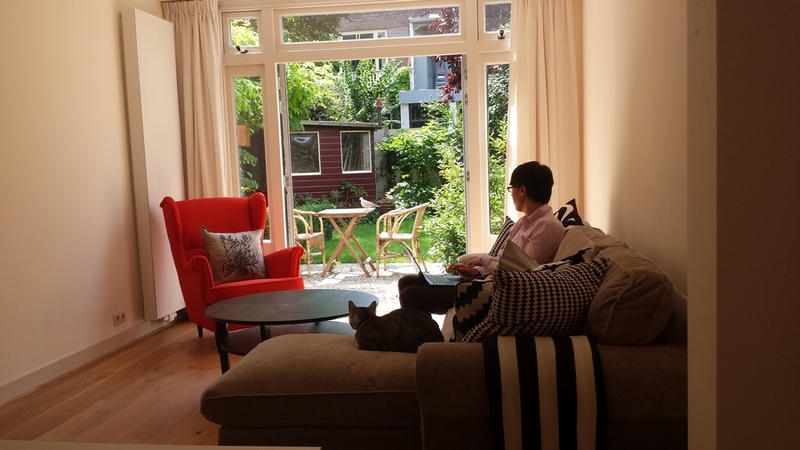 At the beginning of August, we finished clearing out of New York and landed in Schiphol airport with a couple suitcases and a cat. All of our belongings had been either given to friends, sent to family for storage, or packed into a shipping container that was going to be taking the slow boat across the Atlantic (it's still not here yet; hopefully early September). We had an air mattress and an apartment in Utrecht that we'd signed a lease on and transferred a significant amount of money over for sight unseen. That moment pretty much compressed the stress and uncertainty of the whole process into one laser-focused point. We'd spent months dealing with setback after setback on every front of the move. We'd both lived in New York long enough to see just about every kind of scam and shadiness from landlords and rental agencies. Yet here we were, in a new country with barely more than the clothes on our backs, our finances nearly depleted, and difficult to access internationally, trusting that we'd have somewhere to live, based on some email conversations and an online listing with a couple small pictures. Setting foot in our new apartment for the first time, I think we each would've cried if we weren't so exhausted and shocked. Coming from cramped, dingy, loud NYC apartments, we felt like we'd just won the lottery. The pictures had not even done the place justice. Everything was perfect. It was huge. Two floors, so we could live in the bottom floor and keep offices upstairs. High ceilings, big windows, stained glass. Everything newly renovated, clean, and high quality. A small, closed in back yard with a shed (containing an electric lawn mower that looks like it's made by Fisher-Price, but gets the job done), a balcony. All located in a little neighborhood that was both quiet (I think entire days go by without a car driving down our street) but only a couple minutes bike ride from the city center and train station (which is then a 30 minute ride to Amsterdam Centraal). The landlord had even set up internet for us before we got there and left us fresh flowers on the counter, and wine, beer, and coffee in the fridge. We spent the first few days taking care of basic necessities. We bought bicycles (cycling is the primary means of transportation here), explored our neighborhood and the downtown, located grocery stores and cafes, and made the pilgrimage to Ikea. Largely, for the first week before the new furniture we bought was delivered, we'd sort of wander around the empty apartment in a daze, not quite believing we had this much space. I love that image. It sort of sums the thought I have of you up. Quiet. Still. Seemingly busy with thoughts and curiosities, but radiating an inner-peace of stillness. Long hair, short hair, no hair. That I am always surprised to see is not the same, but the peacefulness of you, I am always comforted to see is there in spades.